Avail ticket with as low as P299 base fare on select domestic flights. Check promo details on this post. The latest Cebu Pacific seat sale offer as low as P299 base fare for trips to select Philippine destinations. Cebu Pacific international promo tickets start at P394 base fare. 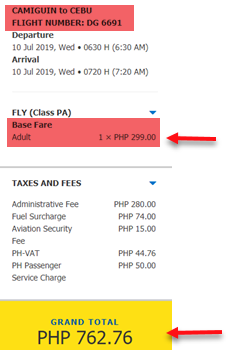 Selling period of promo fares is until January 29, 2019. 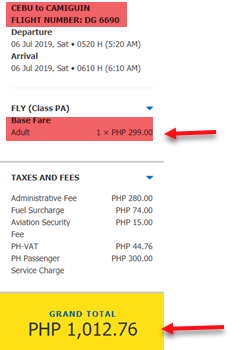 Sale tickets can be used for trips from June 1 until December 31, 2019. Grab the chance to get promo tickets. All Philippine and international routes included on this seat sale. Book or buy tickets as soon as you can. You may avail tickets for your late summer vacation or Christmas getaways. Good for one-way travel, quoted Cebu Pacific ticket rates cover only the base fare and up to 7 kilos hand carry baggage. Web Admin Fee, taxes/fees, Fuel Surcharge, Terminal fees not included in the ticket price. Book the promo ticket online at www.cebupacificair.com where you don’t need a promo code in booking. Buy the sale ticket at Cebu Pacific sales and ticket offices in Manila, Luzon, Visayas, Mindanao. Purchase the low fares at your favorite travel agencies or ticket booking office. Call Cebu Pacific Reservation hotlines and reserve the promo fares with the airline’s CSRs. Booking online is the best way to get the lowest fare for your trip. You may book ticket without a Credit Card. Payment can be done in CASH thru Cebu Pacific Payment Centers. Read How to Pay Promo Fares Booked online in Cash. Plan your trip, check 2019 List of Philippine Holidays and Long Weekend. Get the Cebu Pacific promo tickets the soonest possible time. Promo fares are LIMITED and subject to seat availability. Keep tune for more promo fares 2019 or piso fares 2019-2020. 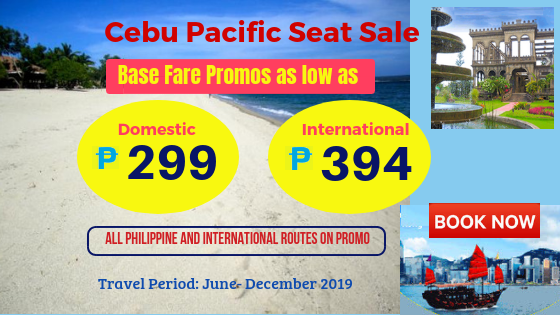 Visit and Like our Facebook: PISO FARE TICKET for more Cebu Pacific and other airlines seat sale and promos!